In less than two weeks, some of the world’s best roller derby athletes will be in San Diego for the Jantastic Invitational Tournament. If you’re a fan of roller derby, and roller derby super-stars, you won’t want to miss this! The San Diego Derby Dolls are hosting the event January 17-18 at the Dollhouse to bring the highest level of competition ever seen in a banked track tournament. Six all-star mixed teams have been assembled and are preparing for battle on the banked track. But who will have the advantage? The RDCL (Roller Derby Coalition of Leagues) All Stars may seem to have a leg up on their competition considering the team is made up of the best players from the five RDCL banked track leagues. The LA Derby Dolls, Battle on the Bank 2014 champions, comprise half the team with the remaining roster filled by the Arizona Derby Dames, Orange County Rollergirls, San Diego Derby Dolls & Tilted Thunder Railbirds top players. And then there’s the Team Atom All Stars, captained by Team USA member and banked track speed skater Atomatrix. Atom handpicked some of the country’s best flat-track players like Licker N’ Split from Rose City Rollers, and V-Diva from Philly Rollergirls. The name might sound silly, but My Little Ponies is no joking matter. 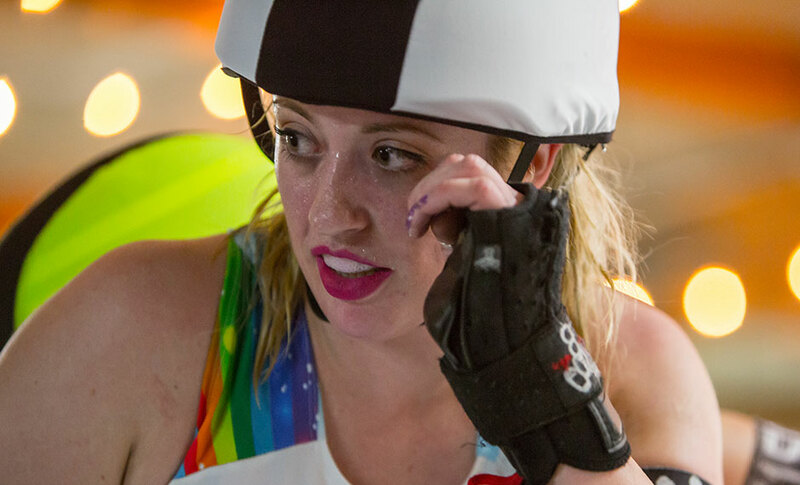 Captained by Hockey Honey (no stranger to banked-track), the team is a mix of all-star banked track skaters like Suzy Snake Eyes from the LA Derby Dolls, and flat track skaters like Baller Shot Caller from Atlanta Rollergirls. We’re promised lots of glitter from Team MLP! Team Rejects, despite the name, is a formidable force with active and retired all-star skaters from flat and banked track. Captained by Killo Kitty, formerly of LA Derby Dolls, Team Rejects boasts the skills of all-stars Amanda Jamitinya from Bay Area Derby Girls (and Team USA) and The 4closer from Sacred City Roller Derby. Maybe Team Bitraxual, captained by Déjà Déjà Vu from Arizona Roller Derby, will have the advantage with skaters that have honed their skills on both flat and banked tracks. Skaters like Vicious Applelicious from OC Rollergirls and Gori Spelling from LA Derby Dolls will have no fear on the banked track. But Team Colorado, made of all-stars from, well, Colorado appears to have the best pedigree on paper. Boasting the most Team USA members, they’re ready to prove that Colorado is a juggernaut in the world of roller derby. Angela Death from Denver Roller Dolls will captain fellow Team USA skaters Pfister from Junction City Roller Dolls and Rivas from Rose City Rollers (formerly Denver Roller Dolls). Which team will have what it takes to win it all? The weekend tournament should prove to be exciting to watch and find out! The first bout kicks off at noon on Saturday, with the final bout scheduled for 6pm on Sunday.